BRUSSELS -- South Korean President Moon Jae-in and German Chancellor Angela Merkel pledged efforts to further develop the countries' bilateral relationship during their meeting on the sidelines of the Asia-Europe Meeting (ASEM) summit in Brussels on Friday. "The two leaders noted the countries continued to develop their complementary economic cooperation based on the South Korea-EU free trade agreement, and agreed to strengthen their future-oriented cooperation in areas of mutual interest, such as the fourth industrial revolution and fostering small and medium-sized enterprises," Moon's presidential office said. During their second bilateral summit, they also discussed ways to peacefully denuclearize North Korea and establish lasting peace on the Korean Peninsula. Moon and Merkel first met on the sidelines of the U.N. General Assembly in New York in 2017. Moon explained the outcome of his third and latest summit with North Korean leader Kim Jong-un in Pyongyang last month. 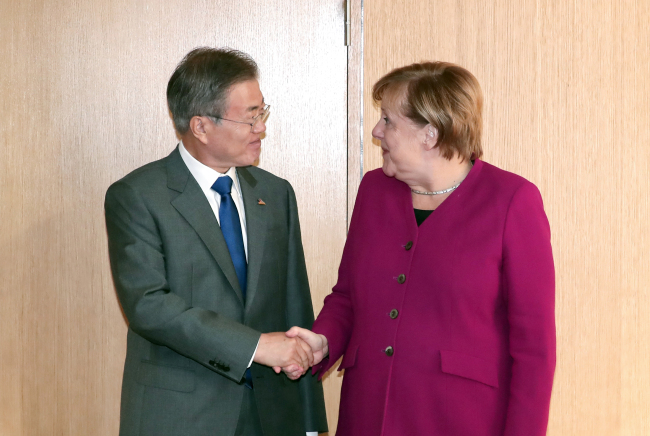 Merkel promised her country's unwavering support for Seoul's efforts to establish peace and praised Moon's initiative for bringing about the recent positive changes on the Korean Peninsula. Moon arrived in Brussels on Thursday following his visits to France, Italy and the Vatican.